NEWS! Today ONLY I, Sir Rudiger, have slashed prices on all A Bigger Slice of the Pie Upgrades. As you make new friends and connect with old ones during the Food Fight, upgrade your pie so you can buy more stock. 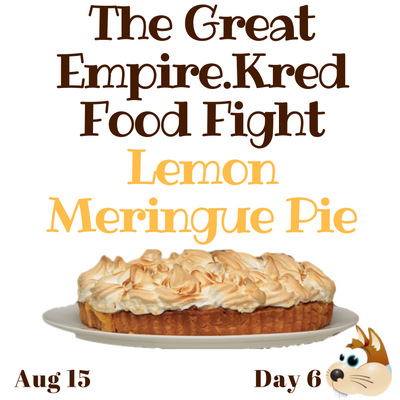 You still have time to join a team for the Great Empire.Kred Food Fight! Check out the lemon meringue pies we're throwing for National Lemon Meringue Pie Day. You can pick up a food pack so that you'll be automatically restocked again on Tuesday. Or, use eaves or choose a smaller pack.